I was maybe five minutes from home when I spotted the Baltimore City police cruiser in my rearview mirror. When I shifted to the left turn lane, the police car did as well. Only one thought crossed my mind: Here we go again. At the time of that 1986 traffic stop in Northeast Baltimore, I had lived in Baltimore for less than a year. But the repeated interactions with police were becoming annoying: In my first 60 days in Baltimore, I was pulled over five times by police — never once with a justifiable cause. There were no traffic infractions. No missing taillights (my Honda Prelude was brand-new). No real reason for Baltimore police officers to pull me over other than the fact that they could. I was lucky to have a voice: At the time I was a police reporter at The Baltimore Sun, and I wrote an opinion column about the repeated police harassment. The traffic stops ended. But the 163-page examination of the Baltimore Police Department released by the Department of Justice (DOJ) this week shows that the people without a voice — and most of them were black — were unfairly targeted and harassed by officers. 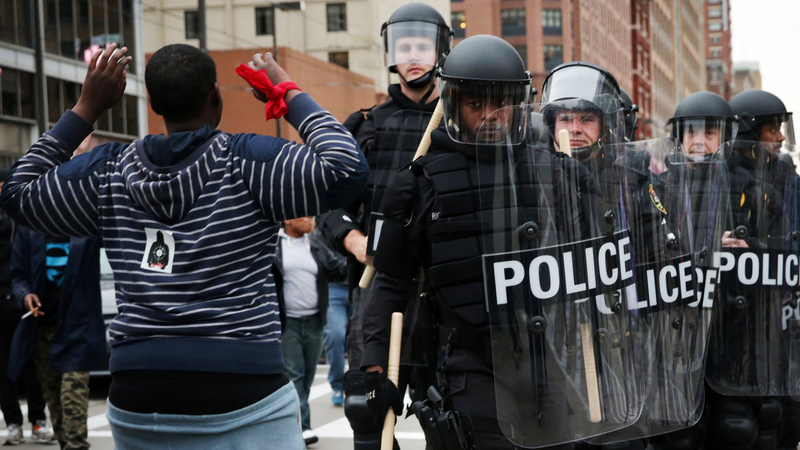 A protester holds up his hands as police in riot gear pass through during a march in honor of Freddie Gray on April 25, 2015 in Baltimore, Maryland. Gray, 25, was arrested for possessing a switch blade knife outside the Gilmor Homes housing project on Baltimore’s west side on April 12. According to his attorney, Gray died a week later in the hospital from a severe spinal cord injury he received while in police custody. An African-American man in his 50s was stopped by police 30 times in four years. None of those stops resulted in a single arrest or citation. The actions of Baltimore police were further put on display last year when a video surfaced of an African-American man being assaulted by an officer as he left a liquor store. As the man, Kollin Truss, was being led away from the confrontation, he was sucker punched by Officer Vincent Cosom as two other officers watched. Incredibly, police initially charged Truss with assault. Which is shocking because police had the video, which was shot by a department surveillance camera on a light pole across the street from the store. Cosom was only suspended after the attorneys for Truss got a copy of the tape and released it to the media. Cosom lost his job and was eventually sentenced to six months in jail. And there lies the problem with police in Baltimore and across the nation: There is no accountability. Officers feeling like they’re above the law allows them to attack citizens like Truss in Baltimore, toss a 15-year-old girl around like a rag doll in Tacoma, Washington, and rough up a woman during a traffic stop in Houston. I asked a black Baltimore City officer Wednesday about the DOJ report. Requesting anonymity, the officer admitted that some of the problems on the force result from the bias of some of his workers who aren’t familiar with urban areas. I encountered many officers with attitudes when I was stopped, but I was quick to flash my press pass before anything had a chance to escalate. 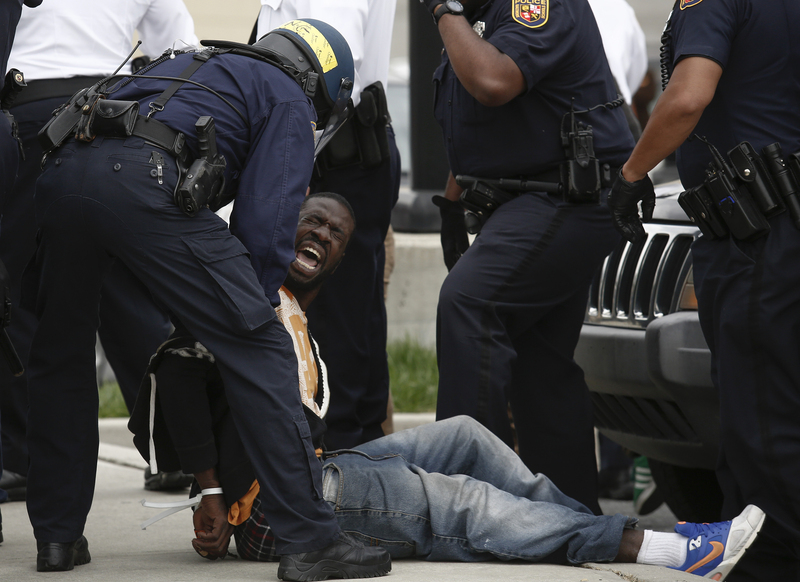 Baltimore Police officers arrest a man near Mowdamin Mall, April 27, 2015 in Baltimore, Maryland. The funeral service for Freddie Gray, who died last week while in Baltimore Police custody, was held on Monday morning. But the excuses they made for the unjustified stops were ridiculous. Once I was drinking an orange soda while driving to work (the officer, traveling in the opposite direction, made a U-turn and pulled me over because he thought I was drinking and driving). The craziest stop happened when I was flagged down by an officer while riding my bike near Baltimore’s Inner Harbor. The reason for the stop: The officer said the bike looked like one that had been stolen. He demanded my identification, and made me turn my bike over so he could record the serial number. As dozens of people watched — and probably assumed I was a criminal — I became furious. Listen, I understand Baltimore has serious problems. While visiting Wednesday, I probably saw more strung-out people outside of Lexington Market than I have in the 25 years that I lived there. Those people should be watched. And counseled. And provided the necessary support to help fight their addiction. But Baltimore doesn’t need officers like the ones who responded to a call from a father whose son, James, was having a mental health crisis. According to the DOJ report, the father explained that his son had a history of mental illness and that he wasn’t armed. Officers still pepper-sprayed and shocked the man with a Taser stun gun. Davis’ remarks referred to his department. If he takes the time to speak with the black residents of Baltimore, he’d find out they feel the same way. This video was produced by Osman Noor and Lois Nam.